Growing up is tough and for 17 year old high school junior Nadine (Hailee Steinfeld) life is at peak awkwardness. Things get even worse when Nadine's all-star older brother, Darian (Blake Jenner), starts dating her best friend Krista (Haley Lu Richardson). Cinema is awash with inoffensive, yet ultimately forgettable, coming of age movies. However, every once in a while, a movie comes along that hits a chord and becomes an instant classic. Kelly Fremon Craig has done just that with her funny and beautifully observed debut, The Edge Of Seventeen. 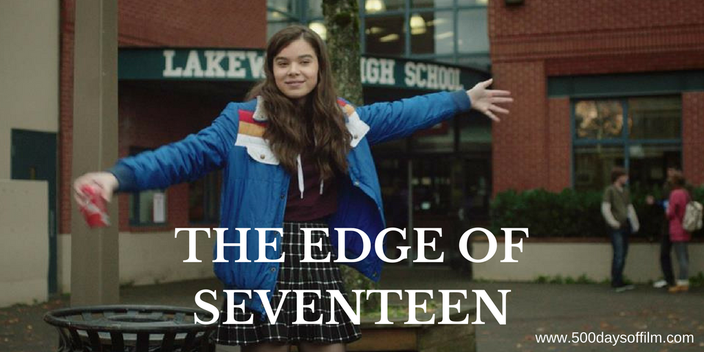 Featuring a whip smart script (written by Craig) that is unafraid to explore the realities of adolescence and a wonderfully spiky central performance from Hailee Steinfeld, The Edge Of Seventeen is an absolute joy to watch. We see the world through Nadine's eyes and she is not always easy to like. She is selfish, crude and she makes many questionable choices. However, we love her regardless - particularly as, on top of the typical struggles of being 17, her life is full of additional heartbreak. Unable to connect with her mother (a brilliant performance from Kyra Sedgwick), Nadine seeks the company and advice of her teacher, Mr Bruner. Woody Harrelson is superbly acerbic in this role and Fremon Craig makes full use of his (genius-level) comic timing. Seriously, if you are anything like me, you’ll spend half this film with a huge grin on your face. So How, you may be thinking, will you spend the other half of The Edge Of Seventeen? Well, I can tell you that I spent that time wishing I could give Nadine a big old hug and reassure her that everything is going to be okay. Being 17 is all sorts of tough and, if I had forgotten that, Kelly Freemon Craig's film certainly brought it all back. Perhaps it is my age, but The Edge Of Seventeen left me with such a powerful sense of nostalgia that I was moved to tears (tell me it’s not my age). For in addition to the comedy, this film has surprising emotional depth, exploring the struggle and beautiful possibility of youth. Go watch it before I get all emosh again. The Edge Of Seventeen was produced by James L. Brooks – the filmmaker behind movie classics such as Terms of Endearment, Broadcast News, Big, Say Anything, The Simpsons, Jerry Maguire and As Good as It Gets. The Edge Of Seventeen reminded me in some ways of Easy A, starring Emma Stone. Kelly Fremon Craig spent six months interviewing and hanging out with teenagers to make sure that she got the details in her film right. Have you seen The Edge Of Seventeen? If you have, what did you think of Kelly Freemon Craig’s debut? Let me know! Leave me your thoughts in the comments section below.